What more can the young living legend say? It was an emotional day for newly crowned World Champion John John Florence as he returned home to his tight-knit North Shore community for the first time since claiming the Title in Portugal last week. 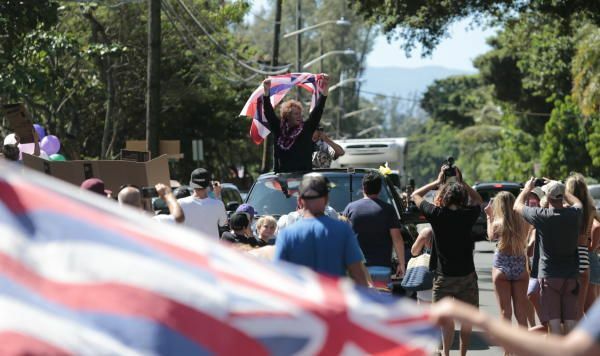 The neighborhood came out to celebrate, lining the streets of Kamehameha Highway between Waimea Bay and Sunset Beach to cheer, wave Hawaiian flags and flash their homemade signs to celebrate Hawaii’s first men’s champ since the late Andy Irons in 2004. By far the most vocal supporters were the hundred-plus kids from Sunset Beach Elementary, where Florence went to school. Students were let out of class to join in the festivities. Hawaii’s newest hero got a great reception on the North Shore to celebrate his World Championship.